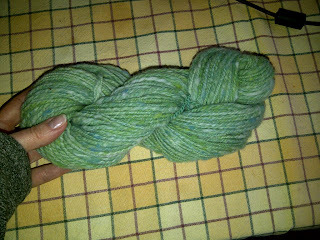 A while ago I started spinning up some samples to make a cabled yarn for another Claudia Evilla skirt. I wasn’t happy with the first sample, seen on the left. The battleship grey is just too dreary for me, so I abandoned any idea of using the grey alpaca exclusively. I did like the feel of the yarn so decided to continue experimenting with cabled yarns. 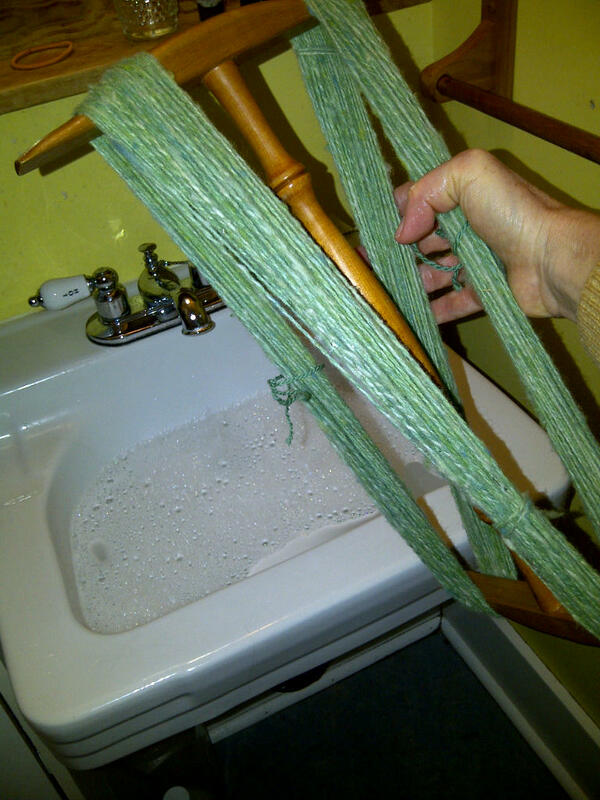 Cabled yarn, as a re-plied yarn, has unlimited possibilities. 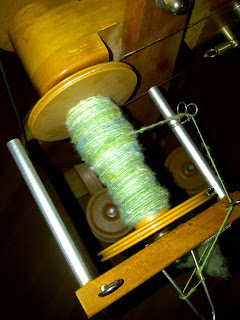 For these samples I spun a two-ply yarn (singles with a Z -clockwise twist and plied with an S-counter clockwise twist). 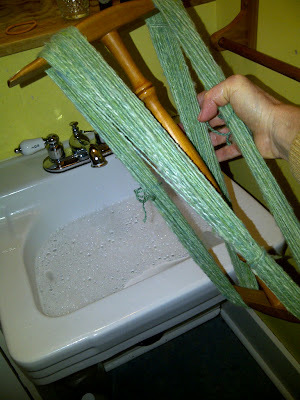 Then you take the two-ply yarn and ply that again using a Z twist. In these samples there are 4-singles. Because of that, there are wonderful opportunities to add colour and other fibres. Which is exactly what I did. If you haven’t yet played around with cabled yarns, I encourage you to do so. A four ply cabled yarn has more strength than a regular four ply — which is pretty strong. Taking the first plied yarn and plying it again adds another level of strength. And if you are using a coloured single along the way, it has a way to tucking the coloured single into the yarn, giving a dotted effect as opposed to a barber pole striping effect that you get when you ply two yarns of different colours. The first skein on the left is the very first, all grey alpaca sample. 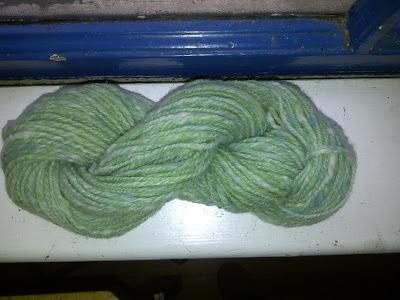 The middle skein has a double grey alpaca ply, plied with a grey and blue fibre from Sweet Georgia Yarns called Placid Waters. 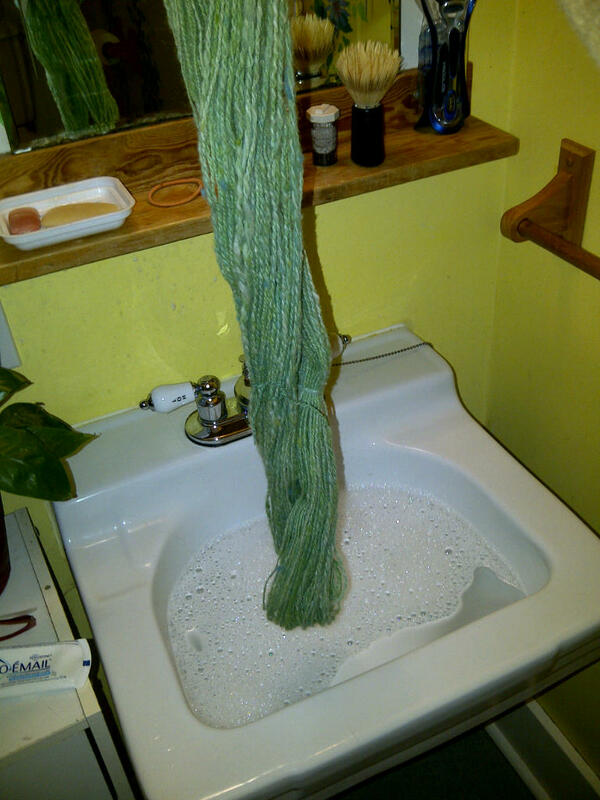 It is 50% merino wool, 25% bamboo and 25% tussah silk. Nice combination for the grey alpaca and to create a fabric that has a good drape. So altogether that one used 3 grey singles and one blue one. 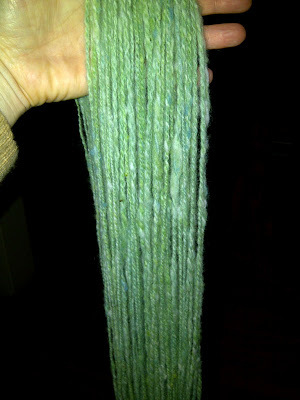 The skein on the right uses two double ply grey and blue for a total of two grey singles and two blue singles. You can see the effect of adding one more blue single each time. The battleship grey falls into the background and the luster of the bamboo and silk start to take over. It’s starting to look a bit like denim — and for a skirt, that may not be a bad thing. Now I have to knit up a sample or two — it’s such a dreary, rainy day I just may get around to that. This entry was posted in alpaca, cabled yarn, Claudia Skirt, handspun yarn, spinning, Sweet Georgia Yarns, yarn on January 29, 2012 by DianaTwiss. Love affair continues. . . 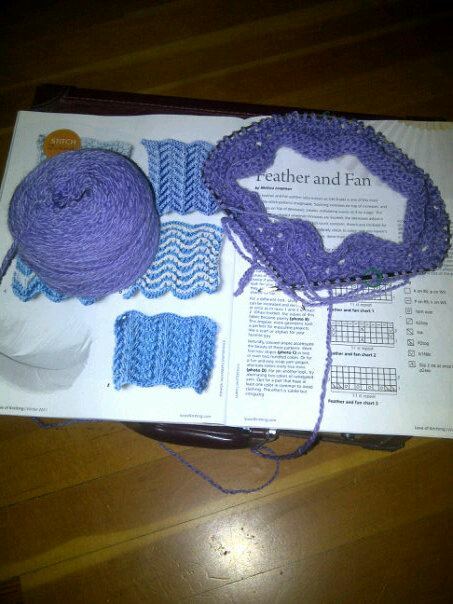 I continue to be smitten with the Feather and Fan lace pattern. It’s quick and easy. In fact, I made this cowl in a little more than a day. During my morning bus ride, I cast on — was able to knit through most of the day long meeting — and was finishing up the picot edging this morning. 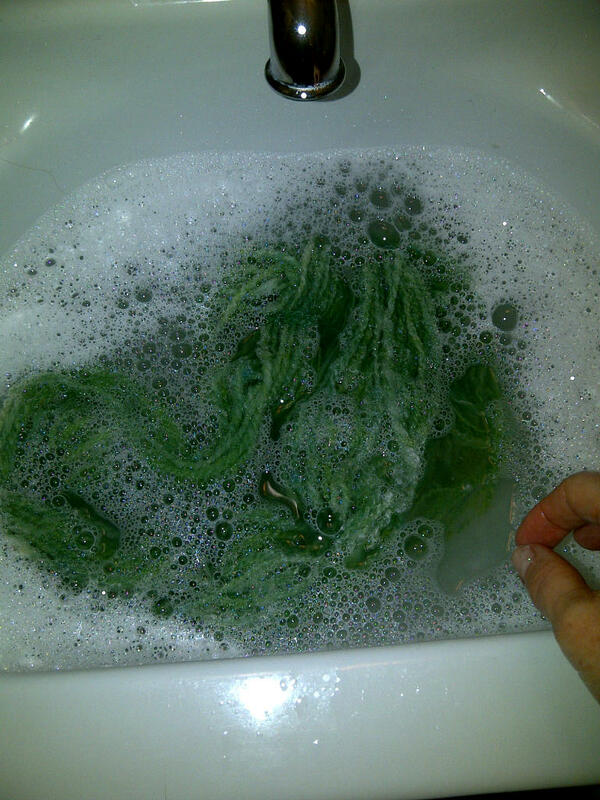 I washed and blocked it. 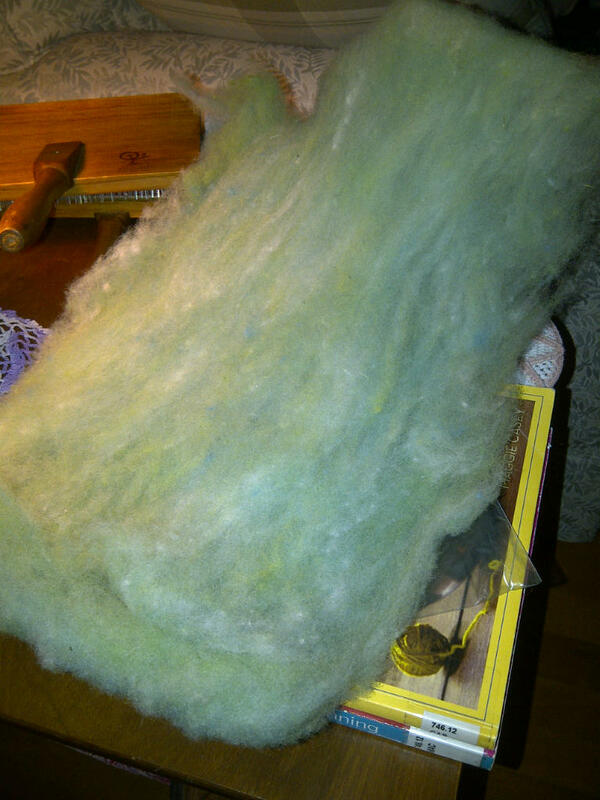 It’s 50% silk so half-way through the drying process, I popped it into the dryer with a few towels to soften it up. I am so pleased with the result and am having a lot of fun with the skirt portion. For this version, I did five increase rounds. I had a lot of this yarn and wanted to see what a longer skirt would look like. Would have gone a bit further execpt that would have made even more stitches for the never-ending picot bind-off. 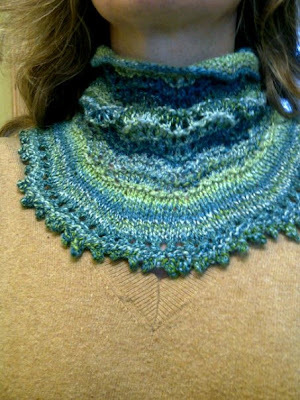 This entry was posted in cowl, feather and fan lace, handspun yarn, knitting on January 14, 2012 by DianaTwiss.